As, indeed, it is: fully 20 of the 28 pages of "improvement" agreement are partially or completely blacked out or "redacted". Opposition leader Danny Williams — remember that guy? — promised "no more secret deals" on natural resource development. Back in the day, the Provincialist Conservatives, when in opposition, made great hay out of demanding that the full text of resource deals be made public. ST. JOHN'S, September 30, 2002 — Opposition Mines and Energy critic John Ottenheimer has challenged the Grimes government to release the legal text of the agreement to development the Voisey's Bay project today. Ottenheimer said, "It is better for the people of the province to see the final contract before it is signed than to discover after the fact that it has as many loopholes in it as the Statement of Principles presented to the House of Assembly in June." Opposition politicians will have one, simple question for Premier Roger Grimes this week when the Newfoundland and Labrador legislature holds a special debate on the Voisey’s Bay mining project: Where’s the legal text? The question stems from the Liberal government’s decision last week to sign a tentative, $2.9-billion development deal with Inco Ltd. based on a so-called statement of principles, rather than a legally binding commercial agreement. "That’s where the truth lies — the devil is in the details," said Ed Byrne, the Conservative house leader. "About 95 per cent of the details have yet to be negotiated." During the debate, which starts Tuesday and culminates in a historic free vote Thursday, Conservative Leader Danny Williams will argue the final draft must be held up for public scrutiny. "What about the final deal itself?" asked Peter Boswell, a political science professor at Memorial University. "Is that going to come before the house? If not, then that’s why this whole thing is a charade." ST. JOHN'S, October 24, 2002 — Danny Williams, Leader of the Opposition and MHA for Humber West, today called on Roger Grimes to provide the people of Newfoundland and Labrador with additional information on the deal now being finalized with Québec to develop the Lower Churchill. "We are asking for additional information on this deal to develop the people's resource so that we can understand exactly what is being proposed and possibly offer a few suggestions that may be able to help the process. Unfortunately, because it is being negotiated in secret, we know very little about this deal and therefore are not able to provide constructive thoughts and suggestions as to how it can be improved," Williams said in a news conference. "The agreement-in-principle reached between Québec and Newfoundland and Labrador involves new concepts and new ideas that were not previously discussed. It is fundamentally different from the principles agreed to with Québec in 1998. In fact, this entire arrangement sprang out of nowhere just days after talks between this province and Alcoa fell apart. There has not been a single update provided to the House of Assembly. We were not able to ask a single question in the legislature on behalf of the people, which is our right and duty as the Official Opposition. The government has an obligation to provide the people with this information in order to allow meaningful debate." So while Kathy Dunderdale diplomatically — and Shawn Skinner condescendingly — suggest that skeptical or insufficiently positive people just need "more information" in order to be convinced of the super-duper nature of the super-duper-megaproject, Dundergov's own web site touting the S.D.M.P., while providing lots and lots of bumpf, including a document entitled Backgrounder – Nalcor Energy and Emera Inc. Term Sheet, is curiously missing one Really Important Thing. Nor is it to be found on NALCO(R)'s own web site, either. So, knowing how very open and accountable the incumbent PC government is... here you go. Warning: it's a bloated, 18-meg PDF that may not like you very much if you are on a slow connection to teh intertubes. Emera, NALCO(R), and Dundergov, could easily have provided a textual version for public consumption, one which would have rendered the 38-page document in a few hundred kb. But they chose not to. Oh yeah, incidentally? All that Voisey's Bay information that Messrs. Williams, Byrne, Ottenheimer, et al. demanded be made public? It was unceremoniously wiped from DanGov's web-server in 2007 for reasons that have yet to be explained. Burford Ploughman is author of a business plan outlining the economic benefits of the tunnel that he believes could save the federal government, this province and Quebec in excess of $2 billion in subsidies over 20 years. 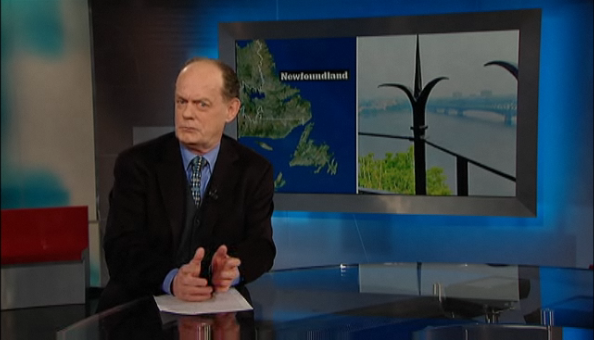 The idea of a tunnel was first floated back in 1979 within the Commission of Inquiry into Newfoundland Transportation. That three-man panel, which included Mr. Ploughman, was tasked to investigate all aspects of transport in the province and presented a report of 160 recommendations, 130 of which were implemented. “It is interesting, we were looking at it back then,” he said. Former premier Danny Williams commissioned a pre-feasibility study in 2004 to investigate the credentials of such a project. Back when the report was released, the concept was earmarked to cost $1.7 billion, however proponents say technological advancements over the past seven years would reduce that cost significantly. The report also suggested combining the road tunnel with power transmission line with a saving of about $390 million. For the record, the 2004 study — actually released in 2005, six years ago this week — recommended a bored rail tunnel, not a road one. But assuming, for the sake of argument, that there have been significant tunnel technology advancements in the past few years, any cost savings that might be realized by that technology would be entirely obviated by building a road tunnel – which has to be much wider and better-ventilated, and consequently much more expensive, than a rail tunnel. Proponents of the tunnel dream would be better off focusing on the much-needed highway connections in northeastern Canada first, namely, finishing the entire Trans-Labrador Highway, Route 389, and Route 138 to modern standards, including finishing the missing piece of the 138 along the Lower North Shore. The road links make financial and other sense with or without a fixed link under the Strait of Belle Isle. The fixed link, well, it may not ever make any kind of sense at all. Without those roads, no one will ever know. That's what Mr. Ploughman, and the two provincial ministers involved, ought to be putting their attention, time, and money towards. MS DUNDERDALE: Mr. Speaker, Nalcor Energy is also leading a three-well drilling program at Parsons Pond on the West Coast. This program will provide critical drilling information to increase interest in West Coast onshore exploration. MS DUNDERDALE: Nalcor is successfully pursuing resource development opportunities on behalf of the people of the Province, just as we envisioned it would. Also, I am obviously excited about the fact that we are now seeing some onshore exploration which is taking place in Parsons Pond. I am very pleased to see that Nalcor has used some of its revenues to help some of the smaller junior oil companies – and I am trying to think of the names now. 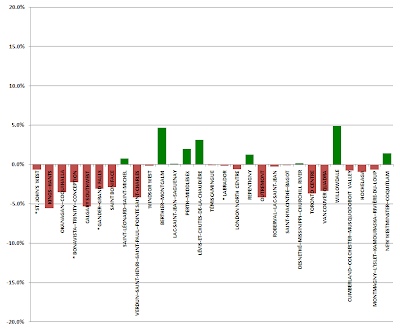 I think Leprechaun Resources was one; Vulcan Minerals is another one, and PDI and these companies. There is, in particular, some interesting exploration going on in up in Parsons Pond. Parsons Pond – there have been reports on oil coming out of Parsons Pond since, I think, 1840. That was when the first report about oil bubbling through the ground must have come from Parsons Pond into government. I know the first oil well in the Province was drilled in 1867. It is very interesting that the year Canada joined together, the various provinces in Canada joined together, that the first oil well in Parsons Pond was drilled. They never did find oil in commercial quantities in Parsons Pond, but people say they did not go down far enough and that it is there, but we will see. We will see, and if we can have discoveries there, if we can discover oil onshore – and there is other exploration going on as well in the Deer Lake Basin, I think Deer Lake Oil and Gas is drilling there. 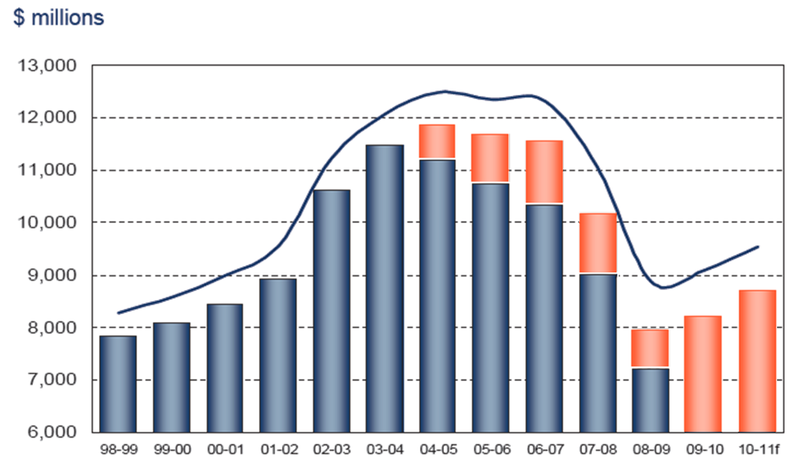 Of course, onshore oil activity is a different industry than offshore. Offshore is obviously very expensive, you have to have these major companies that have access to great sums of capital. I understand to drill a well offshore it is $200 million to $300 million. So if you drill a well and there is nothing there, it has obviously been quite expensive, whereas onshore drilling is much cheaper. The green territories (and PEI) have statutory provisions which obviate the need for a by-election in the final six months before the anticipated dissolution of the legislature. There is a similar six-month cutoff at the federal level in the Parliament of Canada Act. The blue provinces have similar provisions which apply in the final year of the life of a legislative assembly. 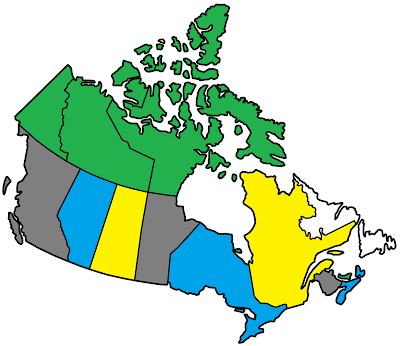 Quebec and Saskatchewan, shown in yellow, have similar, but idiosyncratic provisions. In Quebec, the need to hold a by-election does not apply once four years have passed since the previous general election results are certified, while in Saskatchewan, a by-election is only to be held within the first 40 months after a general election. In Dannystan, thanks to the lack of foresight of the PC government, and the lack of backbone or commons sense on the part of anyone else in the House of Assembly or provincial government, who rubber-stamped Our Dear Electoral Reforms in six calendar days, every vacancy in the House of Assembly must result in a by-election call within 60 days, and a by-election general polling date within 30 days after that. Thus, a seat that becomes vacant 90 days before the expected dissolution of the House of Assembly will result in a by-election, even though that by-election will then take place on the day before the general election campaign officially begins. A by-election must still be called if it occurs 60 days or more before dissolution; the by-election writ will be superseded by the dissolution and general election. Randy Simms wonders why, with months to go until the general election, there had to be a by-election in Humber West. It's really too bad Randy Simms didn't have his wondering cap on back in 2004. That's when Danny Williams-Government amended the House of Assembly Act to reduce — by a whopping 30 whole days! — the time-limit in which a by-election has to be called, yet without the addition of a sensible provision to cover off those cases where a vacancy occurs close to a general election. In one case, it was suggested a resource centre for prospecting and mineral exploration be set up on the west coast. While that would be great, the costs involved would likely be tremendous. A further suggested solution was to have small resource centres set up in either libraries or at campuses of the College of the North Atlantic, of which there are 17 across the island. We are Newfoundland and Labrador’s public college – one of the largest post-secondary educational and skills training centres in Atlantic Canada, with a history dating back more than 40 years. Today we have 17 campus locations throughout Newfoundland and Labrador and one in the Middle East State of Qatar. Yet more anamolies on the electoral math front. 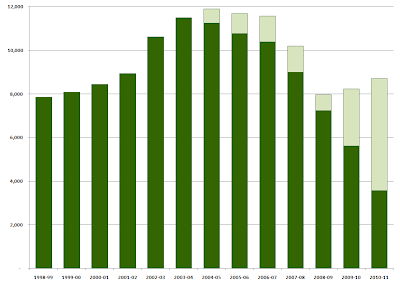 The blue dots are provincial electoral events; the red dots are federal ones; and the green line is the estimated number of persons 18 years of age or older as of July 1st in each year, according to Statistics Canada estimates. 3. Every person who is a Canadian citizen and is 18 years of age or older on polling day is qualified as an elector. 23. Every Canadian citizen 18 years of age or more on polling day is qualified to vote at an election if he or she is ordinarily resident in the province immediately preceding polling day. So it isn't entirely obvious why there should be such a gap between the number of electors that Elections Canada counts, and the number that Elections Newfoundland and Labrador does. Some of the gap can be explained historically: the 1993 federal election was conducted on the 1992 Charlottetown referendum enumeration with revisions; this was the last full federal enumeration. The provincial elections and plebiscite of 1996, 1997, and 1999, were conducted on the same list of electors. But why, between the 2007 provincial election and the 2008 federal one is there a gap of roughly 40,000, and with such wildly divergent trend lines? And how do you square that late provicial downward trendline with the jump in individual district voter counts observed in late by-elections? Just how permanent is the permanent list of electors? For that matter, to what extent is it a list of electors? Heck, to what extent is it a meaningful list of anything? * These are the 1992 federal referendum on the Charlottetown Accord and the 1997 provincial plebiscite on denominational education. 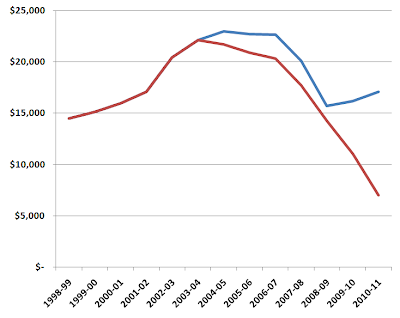 If anyone can provide the total number of eligible voters for the 1995 plebiscite, 'twould be greatly appreciated and 'twill be incorporated into the graph. Both BondPapers and The Telegram fret the low turnout in the late by-election in Humber West. Maybe. Maybe not. As measured against the number of people who voted in the previous general election in the same district, turnout in Humber West was 78% — ninth among the fifteen by-elections since 2003; fifteenth among the twenty-one during which Danny Williams was leader or leader-apparent of his party. Not great, but not quite in the basement, either. But why measure against the previous general election turnout? Well, because it's certainly a long-shot better than measuring against the total number of electors on the list, when that latter figure is clearly a work of creative fiction. A curious little anomoly in the by-election related statistics led this corner to produce the following pretty pretty graph. 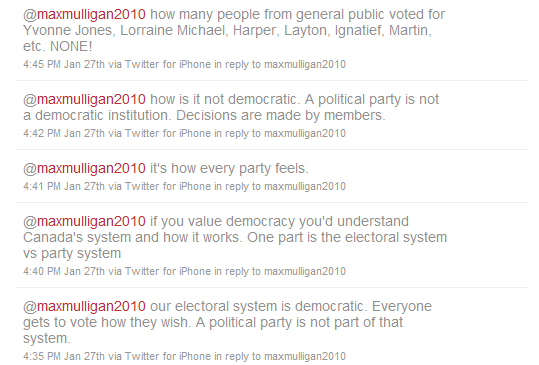 Why on earth were the lists almost always smaller in by-elections, prior to the last general election? Why have they almost always been larger in each by-election since? 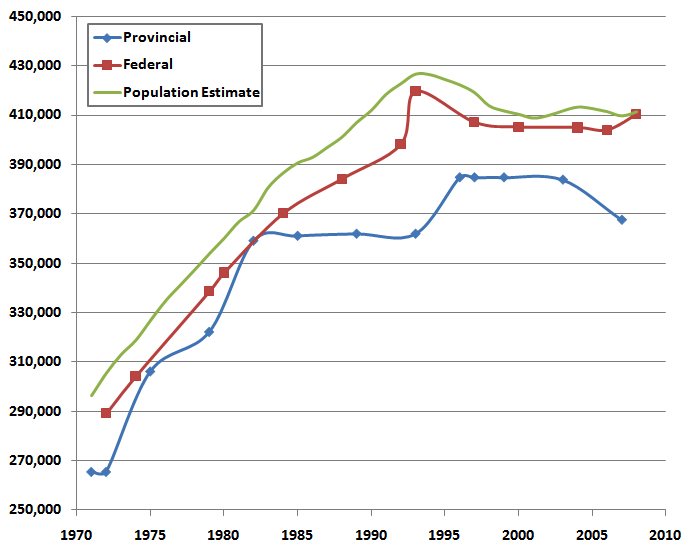 Given that the strange little trend applies to most suburban St. John's districts as well as to rural areas that are experiencing population decline, what can account for this picture? And why is the "growth" in electors so large as of late? Theories, or even wild and uninformed speculation, is more than welcome. 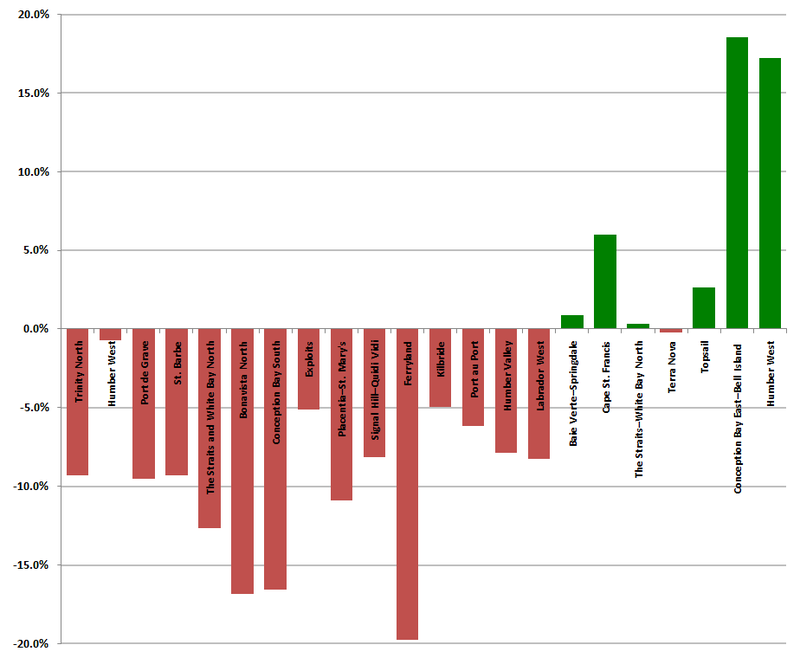 By way of comparison, here is the equivalent graph for all federal by-elections during the same period, with the exception of the three most recent ones. (Final tallies of electors in those three have not yet been published by Elections Canada.) 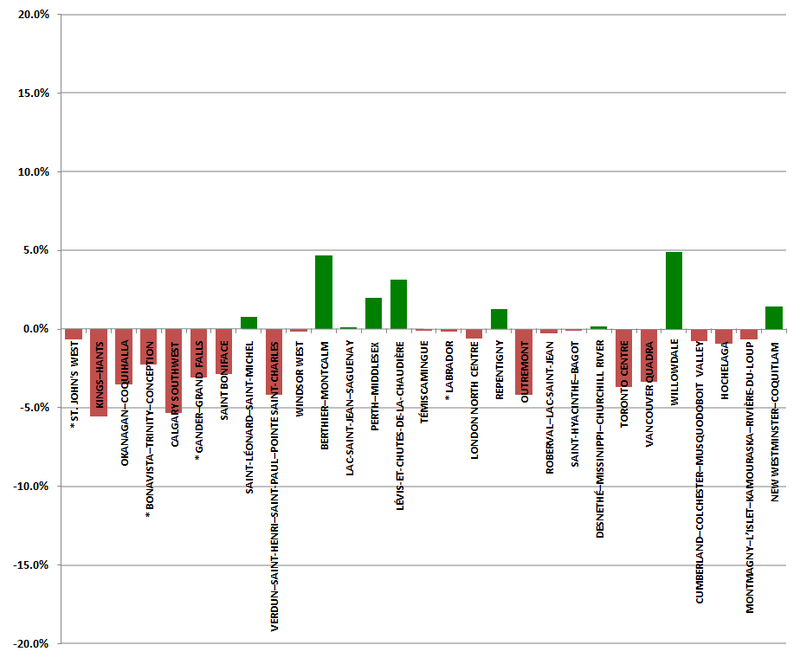 The vertical scale is the same in this graph as in the previous one. Federal by-elections in Newfoundland and Labrador are marked with an asterix. Only two federal by-elections during this period have had voters lists that varied in size by more than 5% from the previous general election. Only five provincial by-elections have had voters lists that so varied by less than 5%. A reminder that Humber West by-election twooting should commence here at this link in short order. Let’s see, now: Labrador mines produce about 90% of the province’s mineral output by value and employ 70% of the provincial mining industry labour force, and Labrador accounts, in recent years, for about two-thirds of the mineral exploration industry, by value, in the province as a whole. Yours truly will be live-"twittering" the Humber West by-election results as the numbers roll in on Tuesday evening, live, on the "Twitter". Tune the bunny ears on your twittering set to this station at 8:00 p.m. DannyStandard Time, 7:30 Black Tickle north. One reason Ontario doesn't "count on" a coast guard, is because Ontario doesn't have any coasts. This rather bold geographical statement may come as a surprise to anyone who can read a map of Ontario produced since 1889, when Ontario met tidewater in James Bay, while Ontario's coastguardlessness certainly relieves a good chunk of the duties of the Canadian Coast Guard's large Central and Arctic Region, which has — or had? — coastguardyish responsibility for the Ontario portion of the Great Lakes. The Opposition is accusing Ontario's Liberal government of wasting $1 million to mail out pamphlets explaining why electricity rates are rising so high. The government began mailing out a six-page pamphlet to every Ontario home this week as part of its pre-election campaign to defuse voter anger over soaring hydro bills. "Time of use" rate pricing is designed to distribute the generation demand more evenly throughout the day, and, in particular, to knock down the weekday peaks that force Ontario to have much higher generating capacity (or import juice) that is not otherwise needed during most of the day. Much like some cities' peak-period transit pricing, there is a combination of carrot (cheaper energy outside of peak) and stick (more expensive during peak) aimed at changing customer behavior. Ontario, like many other energy jurisdictions, has been slow in coming to the realisation that it's cheaper to save electricity, and thereby save the bother and expense of producing and distributing it, than it is to let demand run away without fetters. Negawatts, as they are called, are cheaper than megawatts. 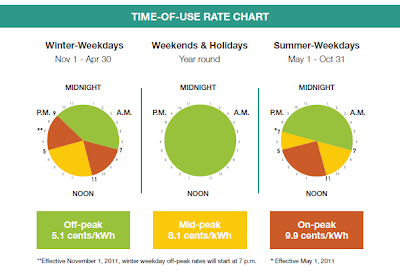 Note the levels that the "so-high" rates are "soaring" to: 9.9 cents/kWh during peak pricing. 5.1 cents during off-peak hours, in the evening, overnight, and early morning weekdays, and on weekends. Those are the residential retail prices. The Super-Geniuses of Nalcor will be wholesaling their juice in a conveniently captive and non-competitive Newfoundland market for nearly triple the proposed Ontario off-peak retail price, and more than 50% above the proposed peak-period disincentive rates. He was referring to extra oil revenues the province has been seeing in the past few years and said the province still has a massive debt that needs to be brought down. He added that oil revenue is finite, and it should be used to invest in programs that would create jobs after the oil wells run dry. 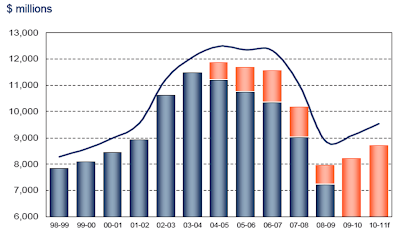 The oil revenue is translated into investment in programs to create jobs after the oil wells run dry. Let's see if anyone can figure out the inherent flaw in this economic plan. After the meeting the finance minister said that he was pleased with what he had heard so far in his travels across the province. But he cautioned that miracles cannot be performed. As has been well established by now, the Williams Dunderdale Provincial Government much prefers to send the wish lists, not receive them. A long-overdue check-in with the provincial by-election that has been largely flying under the radar since it was called a couple of hours ago. CBC Corner Brook: Radio profiles of Liberal candidate Mark Watton, NDP Rosie Meyers, and some other guy. CBC Here and Now: Fish Cove's native son reports. CornerBrookerOnline: Local YouTube journalism at its best. Too bad we out here in teh internet didn't get to see Watton's boots too. "It's pretty cool," [NAMELESS] said. "I mean, there's so many people from all around the province and Labrador, and all these smaller communities - a lot of people you wouldn't meet normally." - A 2011 Youth Parliament participant who shall remain nameless, as quoted in The Telegram, February 4th. A few months back, the Fraser Institute issued a laughable report, ranking Danny Williams as the third-best fiscal performer among Premiers, in terms of managing their respective provinces’ finances. The pallbearer government of Kathy Dunderdale, in the document produced for the annual pre-budget consultation farce, proves just how undeserved that reputation is. 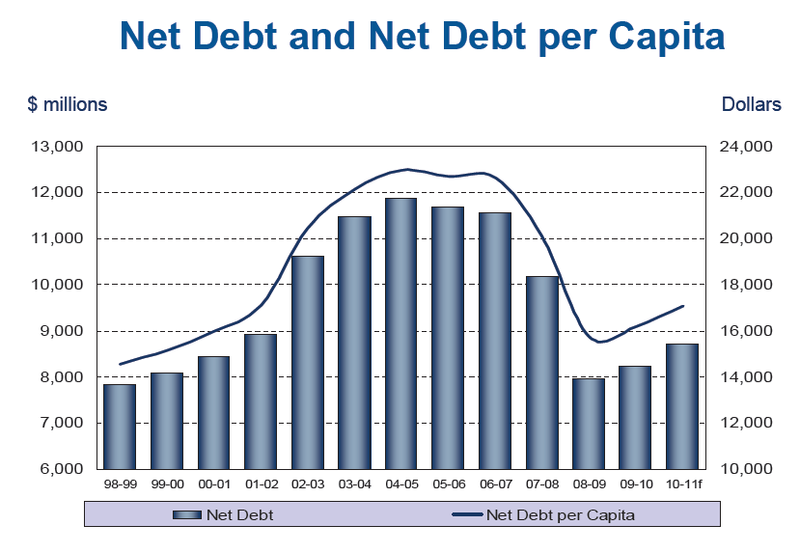 This chart, taken from the document, shows the provincial net debt (columns, scale at left) and net debt per capita (line, scale at right.) Yes, Virginia, the third-best fiscal performer, faced with unprecedented, windfall, and – as we were reminded over and over again during Equalization Wars I and II – one-time offshore oil revenues, managed to go reverse his own brief interval of debt-reduction, and left office presiding over a government whose debt had reverted to its old habit of increasing. What if… instead of blowing the unprecedented, windfall, one-time oil revenues, Danny Williams had chosen a different financial track? Most of the windfall during the Williams years, realized through financial arrangements that pre-dated his entry into elected politics, was spent buying or renting love. No problem was too small to be solved by throwing public money, unprecedented, windfall money, down the problematic hole. But what if he and his government had picked the more conservative, responsible, and prudent course, and used the bulk of those one-time revenues to make a lasting change in the provincial bottom line? 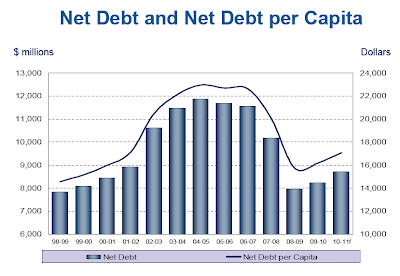 And what about that other important measure, net debt per capita? 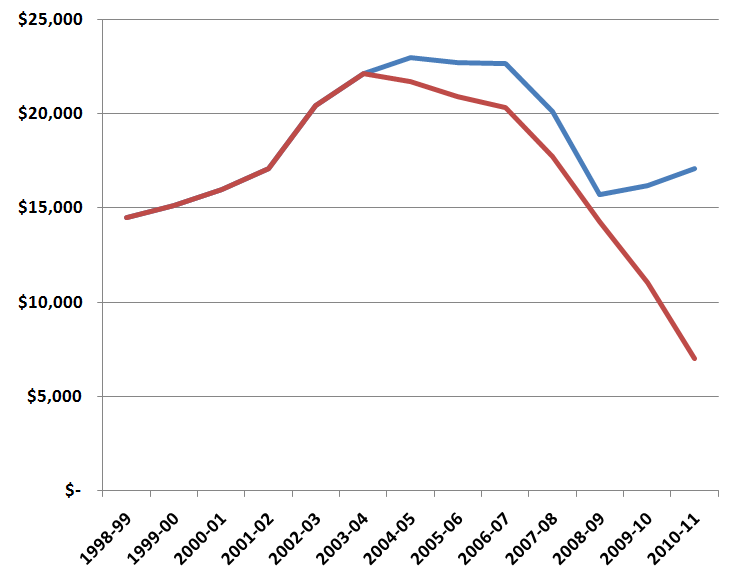 The blue line, transposed from the original chart, shows reality. 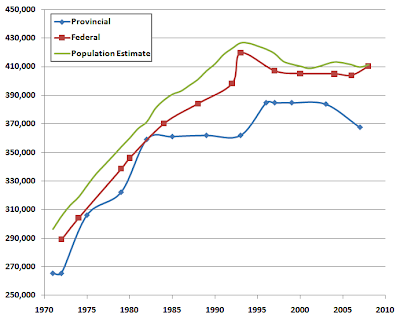 The red line shows an alternative reality, assuming the same population trends as observed over the past decade or so, but also assuming the same super-cautious and aggressive fiscal strategy of getting the province out of debt, fast. There was, of course, nothing responsible or prudent about Danny Williams’ tenure as Premier, and nothing, other than name, that was conservative about it. He chose a different track. That is why a government that collected over $9-billion in oil revenues during its tenure still presides over a $9-billion net provincial debt. And that is why the provincial net debt per capita this fiscal year was over $17,000 and rising, when in the alternative universe it would have been $7,000 and falling, and falling fast. This is the record of the same crew who are now contemplating adding, at a minimum, another $4-billion to that debt — over $7800 for every many woman and child alive in the province today — to build the Danny Williams Memorial White Elephant. That would completely wipe out the modest debt reduction that was realized during the latter part of the last decade, put the burden of paying it off on electrical ratepayers, and the risk of cost overruns or interest rate shock on provincial taxpayers. And they are doing so at a time when interest rates are poised to rise, and when the provincial population has resumed its decades-long downward trend, so that fewer and fewer people will be paying off more and more public borrowing. So, you see the light at the end of the tunnel? Yeah. That would be the train. What gets quite complicated are the relationships between oil wealth and the health of a country’s economy more generally, which requires one to sort through several theories that are not obviously complementary. On the one hand, wealthier countries tend to be more democratic. On the other, it is not clear that the discovery of natural resources actually produces more wealth (one well-known theory, the so-called resource curse, holds to the contrary). But, also, Dr. Ross has hypothesized that the mechanism by which authoritarian regimes perpetuate themselves in oil-rich states is through what he calls the “rentier effect“: popular dissent is quelled through low taxes and lavish government spending. Countries like Qatar and the United Arab Emirates — authoritarian and oil-rich regimes where most citizens nevertheless enjoy a high standard of living — are generally thought to be more stable than others that provide fewer services for their citizens. Les conservateurs font valoir un nouvel argument pour gagner des appuis dans les régions du Québec: les portes du gouvernement fédéral sont plus grandes ouvertes pour les électeurs des circonscriptions conservatrices. C'est du moins ce qu'a laissé entendre le ministre des Ressources naturelles, Christian Paradis, au cours d'une entrevue avec La Presse. M. Paradis est le lieutenant québécois du premier ministre Stephen Harper. À ce titre, il s'occupe notamment de la préparation électorale dans la province. You would think Hugo de Grandpré would know better than to call this "un nouvel argument", though. It's rather the oldest in the book... and well-practiced elsewhere, too. Every year of late, the FinMin, whoever that might be in any given year, not that it matters, conducts a dog-and-pony show across the province, performing as "Pre-Budget Consultations." 2011 is no different. The same show toured in 2010, 2009, 2008 (minus the "Pre-", but with the famous, much-lamented, "Debt Clock"), 2006-07, 2005-06, and 2004-05, and 2004. Now, it would seem that, as part of this travelling "consultation", the FinMin issues a document, which can be perused by interested members of the public, designed to stimulate informed and lively discussion during the consultation sessions. However, in an odd twist for such an open and accountable government, the discussion document is never anywhere to be found on teh internets. However, a kind soul very kindly and soulfully passed along a soft copy of this fascinating document. With security features preventing you from copying it. So, just in case you might ever want to peruse this document and the valuable information contained therein, and, moreover, to be able to copy and paste its content so as to maximize the utility of said document, a copy — with the security features disabled, naturally — is now available for your edutainment by clicking here. 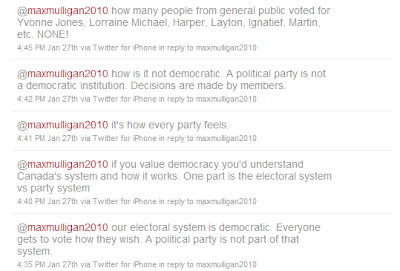 i. to provide for democratic procedures and practices to effect the purpose, aims and objectives of the Party. Of course, after what the PC Supreme Court of Star Chamber has done with the interpretation and application of the words "member" and "membership", it's easy to reconcile the Constitution of The Party with the former Executive Director's unusual take on what The Party isn't. Well, y’know, whistleblower legislation, we want to do right. I’ll be quite frank, and I’ll be quite honest with ya, ATIP legislation, for example, has placed tremendous demands and strains on government. It takes a tremendous amount of time, I know even at my senior staff level, the amount of time that’s taken up in perusing ATIP — now, it’s a good thing, Access to Information is a very, very important thing, but there are a lot of frivolous requests that are very, very time-consuming. The one thing we don’t want to do here is just create another situation where we’re going to put a stranglehold on government. October 2009: Felix Collins appointed Minister of Justice, responsible for the Access to Information Act. March 2010: Felix Collins appoints John Cummings to review the operation of the Access to Information Act. His mandate includes settling the vexing question of "Whether the ATIPPA should contain provisions for dealing with frivolous, vexatious or nuisance requests". June 2010: The Access to Information Commissioner recommends the adoption of provisions that would allow for the denial of Access to Information requests that the Commissioner considers frivolous, vexatious, or frivolous and vexatious. January 2010: John Cummings, surprising almost no one, recommends "that public bodies should have the authority to refuse to respond to requests for information that are frivolous, vexatious, trivial, or made in bad faith." By the time you are finished playing your BREAKING NEWS animation and music thingy, the news has broken on every other channel on the televisor.